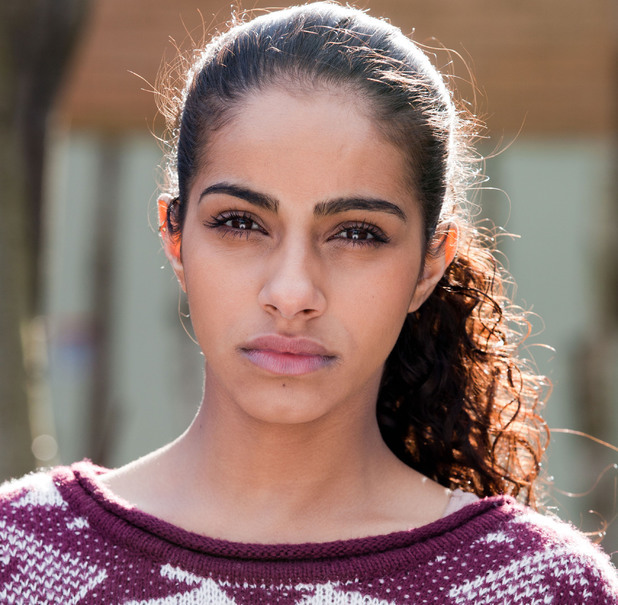 Bubbly 26-year-old Yorkshire lass from Leeds, Mandip Gill, Hollyoaks star who plays Phoebe McQueen talks to Punjab2000 about her role in award winning British soap in an exclusive interview with Amrit. We were first introduced to Phoebe when she entered Channel 4’s Hollyoaks on the streets of Chester, where she then became best friends with runaway George, played by Steven Roberts. The two troubled teens sought comfort in each other as they got tangled up in a serious child grooming case. This teenage tearaway was kept on our screens by Jacqui McQueen who took her in after developing a soft spot for little Phoebe. Amrit gets the chance to catch up with Mandip and learns more about what it’s like being an Asian and playing a character who isn’t necessarily linked to a stereotypical Asian storyline..
How long have you been in Hollyoaks now? I’ve been in hollyoaks about two and a half years now. It has gone so ridiculously fast it’s scary. Apart from Hollyoaks what other programmes have you been in? Hollyoaks is my first television job. Before this I was doing theatre gigs in and around Manchester and doing a whole heap of auditions. This job came at the perfect time as I was starting to doubt my career choice for the first ever time. I’d been to several auditions at Hollyoaks for different parts over the years so when this audition came around I didn’t think anything of it. The role was none race specific and if I’m honest I didn’t think the character was right for my playing range. I went through several rounds (and also lied about my love of dogs to get the part! *laughs*) I am so grateful to Emma Smithwick, the producer at the time and our current producer, Bryan Kirkwood for giving me such a great opportunity. Not once has the character been involved in any stereotypical Asian topics. Phoebe’s character isn’t seen for her race. Which I think is very rare. Were you much of a Hollyoaks fan before you got the role? I have older siblings who watched hollyoaks so growing up so I used to watch the soap along with all the rest of them. Weirdly my favourite family were the McQueens, so you can imagine how excited and proud I was when Phoebe became an official McQueen. It has been so amazing to be apart of such a popular soap family. Everyone knows who the McQueens are! Are there any similarities between Phoebe’s character and yourself? I’d like to think that weren’t that many similarities between us. I try to keep it that way when making character decisions. I’m nearly ten years older than my character so our mannerisms and characteristics are very different. I try to keep Phoebe young and a tomboy. Outside of work though, I must admit I am a little bit of a tomboy so I’d say that would be the similarity. However I don’t own half as many hoodies as Phoebe! So you play the role of Phoebe McQueen. What is it like playing the role of someone with a different identity? I have to say, playing a character with no race specific storylines has been amazing. They write her like any other person, her actions, decisions reactions etc are based purely on Phoebe as an individual and not on her race. Phoebe is mixed race Asian and White but we’ve only ever seen her mam. Maybe the topics will change if her dad was introduced, and rightly so in my opinion. Do you ever get people stop you in the street or when you’re out and about like “Hey! There’s Pheobe from Hollyoaks”? You’ve had some eventful story lines in Hollyoaks, what’s been your favourite and why? My biggest storyline and I’d say favourite one, was the grooming storyline when I was introduced in the show. It saw my character meet George on the streets and together they ended up in the hands of child groomers. I enjoyed this storyline because I had meaty scripts to work with, it was very topical at the time and it was the beginning of Phoebe and George’s amazing friendship which still continues in the show now. When you’re not filming, rehearsing or busy being an actor what do you like to get up to? When I’m not working I like to eat! *laughs* I’m forever eating out with my friends from the show Steven, Aaron (Sonny Valentine) and Jason (Alfie Brown-Sykes). I took up knitting for a while and go to the gym in preparation for a half marathon in October – My cousin Alicia passed away last year from cancer. She was only 22 and we were all really close. The marathon I mentioned is to raise money for Alicia’s charity, www.aliciaboparai.co.uk to raise funds in her name to help other sufferers out there. Tea or Coffee? Tea. Preferably Indian tea. Coffee makes me weird…I cry! Cats or Dogs? None! I’m petrified of dogs I stop breathing! Scone or ‘Scon’? Scone. I’m posh! Mum or Dad? Both! me and my siblings call them MAD (mam and dad rolled into one) they come as a package!